I have also carried roasted chana to the movies. Chana as in chickpeas. Garbanzo beans. But cheap as they are, they’re not a suitable cinema snack. It is imminent that you will get stuck with a dud chana that will detonate in your mouth, against your teeth, and you will imagine that everyone around you has heard this gunshot sound. Those people in row C in front, the family in row A behind — they’re all wondering what is going on with you and your grinding molars, this inexplicable pursuit of a stubborn chana. So, chickpea fail. Banish the garbanzo bean. It’s the civilised thing to do. Nuts — almonds, cashews, even seeds; sunflower, pumpkin — are just… meh. Too many calories. Too heavy. Too boring too quickly. And there are BMIs to think of, nutritional goals to keep up. So, after a few rounds of alternatives, I have realised, makhanas win. They come from the lotus flower, you know? And they are perfect for the movies. Crunchy, light, healthy; you’re not left with a sickening feeling. You don’t have to skip dinner. Your intestines are spared the onslaught of popcorn. Your fingers are spared the sticky/dusty red layer of caramel or cheese that comes coated on overpriced and improperly buttered corn. It’s a conspiracy. Why does no one think of us alleged health freaks? 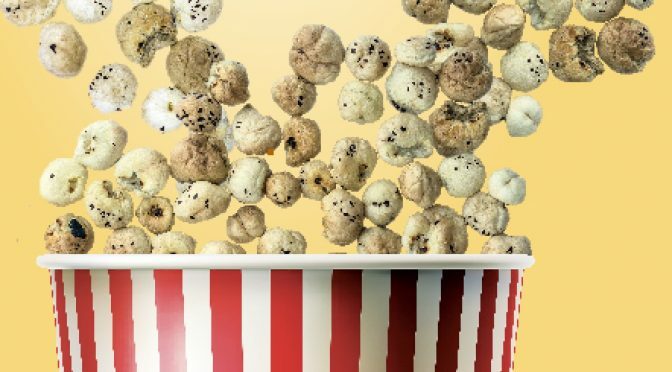 Net-net, there are shark-infested waters to navigate when you’re at the movies and you want something healthy to eat. Let me be clear: it is impossible to be a frequent moviegoer and eat healthy (or cheap!) if you’re going to rely on what they have to offer. They are the enemy, feeding you toxic garbage that will wreck your innards and cause your skin to break out. Like the other day, I went to watch Juliet, Naked at Mall of The Emirates — relax, PG-13; don’t turn hyper at the name — because a.) it was a Nick Hornby book-based screenplay and I love Nick Hornby; funny man, after my own heart and b.) Ethan Hawke-starrer and, well, same reason as above — deep appreciation for both men. Anyway. I was hungry. I had made an impromptu plan. Went straight after work so I didn’t have makhana on me. Usually, I am a better planner. So, what did I do? I succumbed. I thought, wow, really, they have pizza here? And it was a brand I like enough, so I ordered myself one of those tomato-cheese pizza Margherita thingies and, guilt aside, I ate the entire thing by myself. This was one of those solo movie outings — which are the best, by the way. Don’t let anyone tell you otherwise. No one disturbs you with their unremarkable comments or whispers or laughs or asks stupid questions. It’s just you gaping at a screen. A true cinematic romance. I feel bad for my friends who can’t go to the movies on their own and who say they feel strange and self-conscious in the big bad theatre. To which, I just want to say: boohoo, shut your face, nobody cares. And if they do, how does it matter? Keep calm and eat your makhana. And this is really about the makhana. I went to Ibn Battuta Mall some time back for a movie and they were selling steamed edamame. I commend their effort, but it’s not a movie food, guys. What are we going to do with those strawy-thready bits? Toss them at the talker in seat C-7? Or that guy who won’t put his phone down, blinding the rest of us with the glare from his iScreen? Nachos, at the movies, I am scared of. I feel the chemicals in them will alter my DNA spirals and turn me into one of those white rabbits with pink eyes. It’s not rational, I know. But if people can worry about what are other people going to think of them watching movies solo, I can worry about how a cocktail of MSG and god alone knows what else will alter my poor red blood cells. One of the new places with a ‘dine-in movie experience’ even has something on the menu called ‘Trash Can Nachos’. I am not making this up. I wish the ‘urban movie experience’ made healthy eaters feel spoilt for choice. But where’s the money in that, right? No business sense. So between those nachos and that popcorn and the odd reptilian hotdog — alright, the pizza that day wasn’t bad — I feel squarely in the minority. A part of me also wishes I hadn’t opened my trap about the makhanas because now some wiseguy will get three pals together, a graphic designer will do some logos, and we’ll be inundated with ‘handcrafted foxnut’ that will yield gleeful profits for those three pals. I can just see it. Nice organic-looking packaging that shrieks eco warrior. They’ll probably have strange flavours too. Oolong and litchi. Wasabi and coriander. As long as I can sneak in my healthy contraband, I won’t complain. Previous PostIt’s lonely and expensive for us expats without video chatNext PostRemember when a dirham would fetch three rupees?